Thanks to psychoacoustic optimisations like the Vortex-Control Notches, the new SCD Drive System and Noctua's premium-grade SSO-Bearing, the NF-P12 achieves exceptional quietness and long-term stability. Psychoacoustic optimisations like the staggered make the NF-P12 surprisingly quiet. 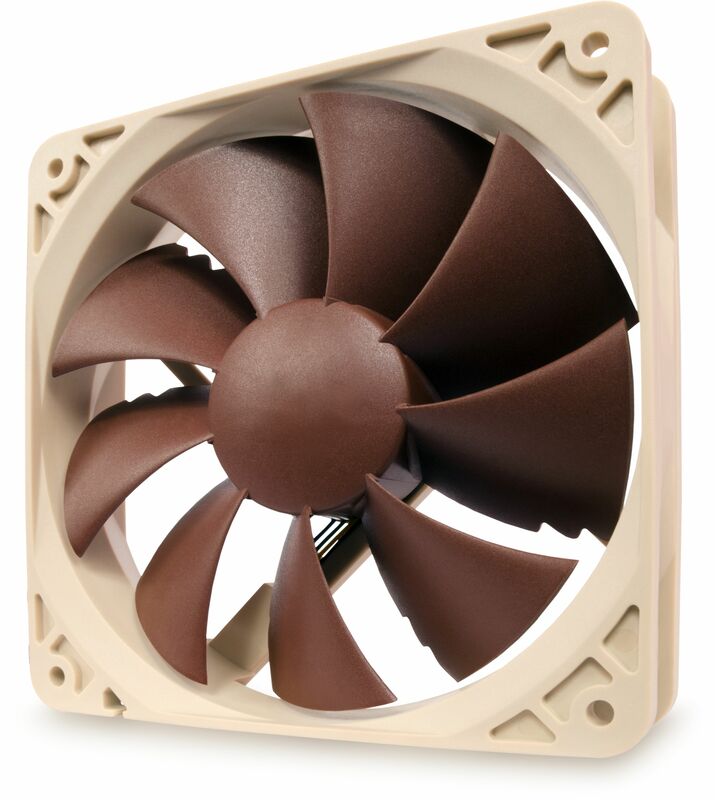 For more information on the technical background of the fan please visit Noctua's website here. This fan is definitely as described, it shifts a lot of air for such a low amount of noise. A must buy for any quiet pc. Excellent fans, very easy to install good quality will buy more if I need them. This is a very good fan. It delivers a good flow of air through small spaces quietly. However mine won't start on a speed controller on less than 900 rpm and whilst the manufacturer claims 12.6 db at 900rpm it produces a noise (that isn't airflow) over my 16db pc, and the only speed that it is quiet is 500 rpm. However the 140 cm fan is very good. Looking at Scythe silent wings or Akasa Apache for upgrade - looks like rolls royce shaped wings but quietpc need a nudge to get some in. Yes they are expensive but I've not found anything quieter that still moves the air. Default purchase for me on any new PC. These things are virtually silent yet still push a decent amount of air. I installed 2 in a HTPC case with silicone gaskets and using the included black (low noise) resistor and I am very impressed. Put a pair of these into a case with a fanless heat sink. With a silicon gasket and the silicon mountings, there is no appreciable vibration transmitted to the case, yes they are pricey, but more adaptable and usable for the average case modder. Can only recommend. I've had one of these fans now for 2 years running on a over-clocked 2.4 GHz quad-core q6600 running at 3.4 GHz. It runs whisper quiet and is so efficient I haven't needed to mess with the stock fan speed at all. If these fans came in more sizes I would replace every fan with these, even ones inside the PSU. I wouldn't let the quirky colour put you off, I like it, makes me think it was designed by some mad Russian scientist who discovered how to make the perfect fan but was never taken seriously. I have 3 of these fans in my system, although they are a bit pricey they are very well built and appear to outlast other fans multiple times. I have now decided that these are the only fans to use for the majority of my systems. As always the service from Quiet PC was faultless.